Delhi Daredevils captain Zaheer Khan and Chak de India actress Sagarika Ghatke have officially stamped their relationship with announcing engagement. 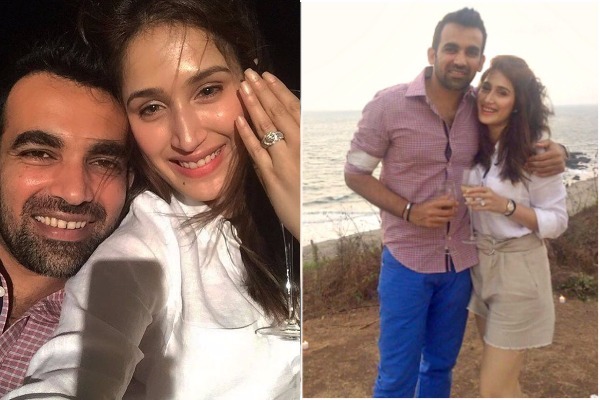 Zaheer Khan on his twitter account announced his engagement with Sagarika Ghatge with the cutest caption, “Never laugh at your wife’s choices. You are one of them !!! Partners for Life #engaged Sagarika Ghatge.” He also shared adorable picture of them together. Sagarika is seen flaunting huge diamond ring in the pic. The duo kind of raised the rumor of being together when they had appeared together for Yuvraj Singh and Hazel Keech’s wedding last year. #yuvihazel wedding marathon finally ends. Congratulations @yuvisofficial @hazelkeechofficial . It's time to head back to the bay . Sagarika Ghatge rose to fame after playing a character of Indian hockey player named Preeti Sabarwal starring Shah Rukh Khan in movie Chak De! India. Currently Zak(he is fondly called by this name) is in captain-ship of Delhi Daredevils IPL match. Currently the team is ranked number sixth in the points table. The 38-year old has played 95 IPL matches so far. He played an integral part in India’s World Cup victory in 2011. He took retirement from international cricket in 2015. Zaheer will soon join the bandwagon of married Indian cricketers following Yuvraj and Harbhajan. Many congratulations to the happy couple Zaheer Khan and Sagarika Ghatge. Previous : Kapil Sharma Bursts Into Tears On The 100th Episode Of The Kapil Sharma Show! Next : Dharmendra and Hema Malini’s Daughter Esha Deol Is Pregnant With Her First Child!